One of New Zealand rugby league’s traditional heartlands, the Otahuhu Leopards beat a determined Bay Roskill outfit 34-20 at Mt Smart Stadium #2 today to ensure they return to the Fox in 2018. 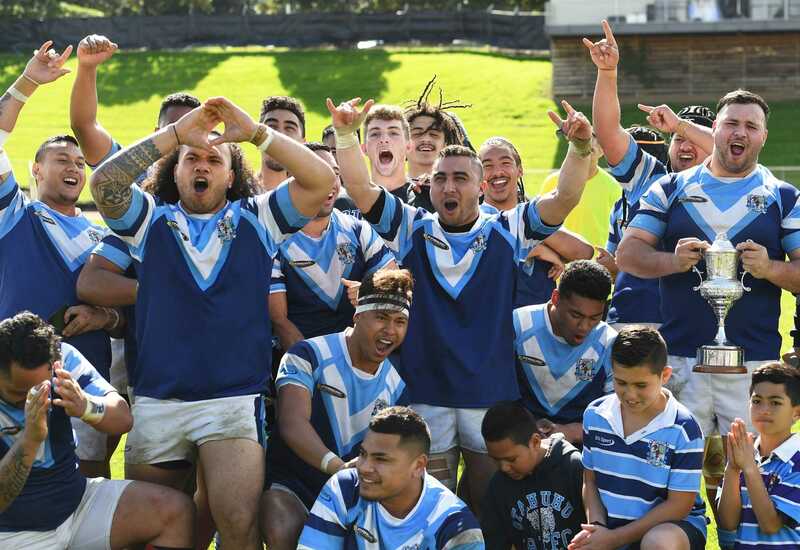 It was sweet redemption for the south Auckland side, who for the first time in history were relegated to play in the Sharman Cup competition last year only to return to first division a year later. This year Otahuhu had stormed to the minor premiership with only three losses through the competition rounds and looked equally devastating to start the final on Saturday, coming out firing and looking to dominate the Vikings with a physical approach. It paid off almost immediately when second rower Antansio Kuea crashed over in the first minute. The kick went wide and the Leopards held an early 4-0 lead. But Bay Roskill wrestled back momentum a few minutes later with centre Matthew Whyte crossing over after a shift to the left. The conversion was unsuccessful locking the score at 4 all. The Vikings got another in quick succession off the back of an offload from standoff Ezekiel Paul. Fullback Jerome Vogel converted to get them up 10-4. With ten minutes to go in the first half, Otahuhu went strong on attack. Standoff Shaun Motu-Muavae took a big hit close to their line and the ball slipped out the back into the hands of centre Ethan Nukanuka who added another four reducing the score 10-8. The Vikings had opportunities to score again, but Doyle seized a lost ball to run 60 metres down the opposite end and winger Sitiveni Taufa crossing to get them in front 12-10 at the break. Otahuhu started the second half just as they had the first, scoring after five minutes through halfback Brodie Clark. Fullback Geronimo Doyle converted to get them up 18-10. Doyle went over ten minutes later converting his own for a 24-10 lead, and the Leopards were beginning to assume control of the match. But Bay Roskill hit back, looking very much still in the game with Cree Braithwaite finding space before a looming fullback Jerome Vogel reduced the deficit to 28-14. Both sides traded points in the last five minutes, but it was Otahuhu's fitness which got them through to secure a 34-20 victory on the hooter winning the Crown Lift Trucks Sharman Cup and promotion to play in the SAS Fox Memorial Premiership in 2018. Otahuhu captain Connor Purcell said fitness played an important part in their match-up today. "Fitness has played a huge role in our performance this season. We knew we were fit and ready for today's game… and that's what got us over." Purcell said returning to first division has always been the goal. "We worked hard all season, we've just won the Sharman Cup and it's a great feeling knowing we'll be back in the Fox Memorial Premiership next year." "I'd like to thank Bay Roskill for really testing us this season and all of our supporters who have been here week in week out." Bay Roskill 20 (Jerome Vogel, Matthew Whyte, Mackenzie Kata, Silila Vaivai tries; Jerome Vogel x2 goals) Otahuhu 34 (Geronimo Doyle, Emeliano Mikaele, Ethan Nukanuka, Atanasio Kuea, Sitiveni Taufa, Brodie Clark x2 tries; Geronimo Doyle x3 goals).